We made it to the first Motivation Monday of spring! Now’s the time to get psyched for those outdoor workouts, new group fitness classes and maybe even splurge on some new workout wear. As we tweak our routines, it’s also the perfect opportunity to make a conscious effort to eliminate one horrible habit I see far too many people engaged in during a workout. It also happens to be my biggest pet peeve when I’m at the gym. I’m taking about texting while exercising. Impacted balance and stability by 45%, compared to not using a phone. Simply put, texting can raise the possibility of injury from everything from falling off a treadmill or rolling your ankle during that power walk. Then there’s the fact that texting and taking up space on a machine is just plain inconsiderate. If something is so important that not replying immediately will put someone’s life in danger, step away from the machine, let someone else attack a set and work back in when you’re focused. Sure, emergencies will happen, but unless you’re on call as a physician or some kind of emergency responder, the world won’t end if you take 10 extra minutes to reply to a text. If you know you’re easily distracted by that smartphone, you may want to consider signing up for more group fitness classes this spring. You’ll be forced to put that phone away for the duration of the class and you can focus on your form and intensity level. Don’t be shy about telling your family, friends and even co-workers if there’s a time of day that you’ll be unreachable. You’re making the effort to exercise and take care of yourself, so you also deserve a sliver of time that truly belongs to you. It’s having those few precious moments of me time that can help all of us be better partners, parents, caregivers and employees. Smartphones provide tools that can help many of us in our health and fitness journey. They give us access to online workouts, heart-pumping music and apps to keep track of everything from our steps to our calories to whether we’re getting a good night’s sleep. But texts and emails shouldn’t be a part of anyone’s workout routine during any season of the year. So let’s make this the spring we stay focused on what we really need to attack our plans to have fun, be fit and feel fabulous! 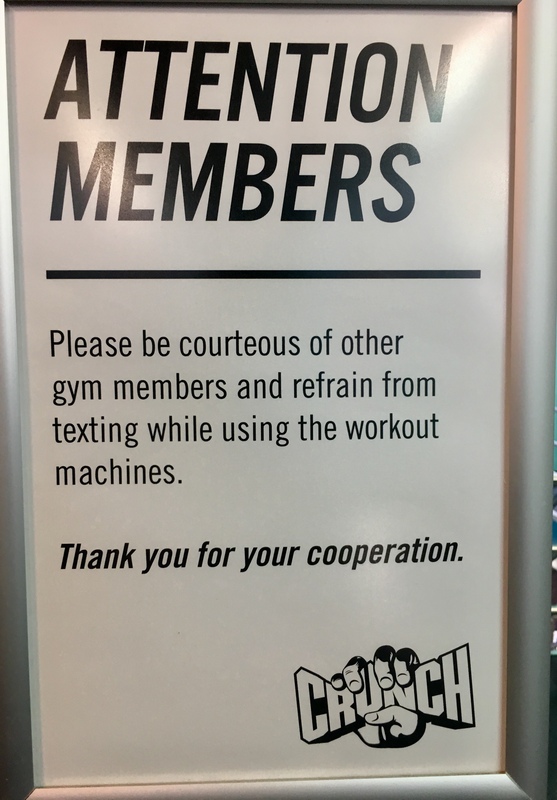 Posted on March 25, 2019, in Fitness, Health and tagged Fitness Tips for Spring, Group Fitness; Crunch, Gym Etiquette, Motivation Monday, Personal Fitness, Texting & Working Out. Bookmark the permalink. Leave a comment.